The pyramid cedar tree is a cultivar of Thuja occidentalis, according to the University of Florida. The complete botanical name of this tree (or shrub) is Thuja occidentalis "Pyramidalis." The tree differs from the shrub only in that the form of the tree is shaped rather like a narrow pyramid. 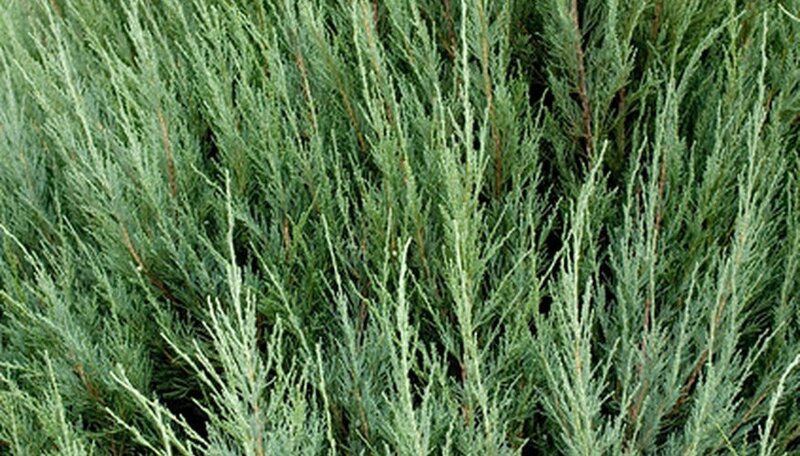 Thuja occidentalis is popular with home gardeners for its hardiness and low maintenance. "Pyramidalis" is one of the smaller cultivars of T. occidentalis. This tree only grows to15 feet tall, according to Ohio State University, with a maximum spread of 4 feet at the base. For this reason, it is often cultivated as a shrub rather than a tree. The foliage is dark green, with tiny leaves that pressed up against the wood. This makes the branches and twigs look rather like they are covered with small, flat green scales. Although these plants are evergreen, the foliage may turn a shade of brown during the winter only to "green up" again in the spring. These trees are cold-hardy, making them an excellent choice for landscaping in climates with snowy winters. In fact, pyramid cedar trees are cold-hardy to USDA Plant Hardiness Zone 2, according to the University of Florida. They are heat-hardy only to zone 7, and thus will not tolerate tropical or subtropical climates. Thuja occidentalis "Pyramidalis" can tolerate a range of soils, from clay to sandy and even poor soils, according to Ohio State University. These trees and shrubs are drought-tolerant but grow best in soil that is cool and slightly moist. They prefer full sunlight or partial shade, and will not thrive in areas that are completely shaded. These trees tolerate minor pruning very well and can be used as hedges or privacy screens. In fact, the foliage gives off a very pleasant fragrance when sheared, according to Ohio State University. Pyramid cedar trees can also be used in urban landscapes, as they are very tolerant of air pollution. The inner leaves of the tree fall off during the autumn, and should be raked up to prevent any possible fungal spores from overwintering in the soil. Heavy winter snows and ice can weigh the tree down and cause the upper branches to spread, separate and even break from the form, ruining the pyramidal shape of the tree. Thuja occidentalis is highly susceptible to bag worms, which can completely defoliate one of these plants in a single growing season. Pyramid cedar trees can also suffer from a number of fungal diseases and other insect pests such as leaf miners and mites. "Pyramidalis" in particular also suffers from winter burn. Exposure to cold, drying winter winds will cause the tips of the foliage to turn an unattractive brown color.